Primarily, the Army Senior Reserve Officer Training Corps (SROTC) program is a college scholarship program (although it is certainly possible to participate in the program without receiving a scholarship), leading to a commission in the United States Army. The overall mission of the Army SROTC Program is to produce commissioned officers in the quality, quantity, and academic disciplines necessary to meet Active Army and Reserve Component requirements. Civilian colleges - These are schools that grant baccalaureate or graduate degrees and are not operated on a military basis. Military junior colleges (MJC) - These are military schools that provide high school and junior college education. These schools do not grant baccalaureate degrees but meet all other requirements of military colleges. They administer both the Junior and Senior ROTC programs. A Host Battalion has a formal agreement between the Secretary of the Army (SA) and the academic institution. Host battalions are assigned a Professor of Military Science (PMS), staffed to instruct and recruit cadets; and provide for their own administrative and logistical support. The PMS and staff are specially selected Army commissioned officers. An Extension Center has a formal agreement between the Commander of Army ROTC, and the university or college. Extension centers are assigned an assistant PMS or officer in charge and are staffed to instruct and recruit cadets. These centers receive their administrative and logistical support from their host ROTC Battalion. A cross-enrolled school has an agreement (formal or informal) with a host or extension center that allows for the transfer of academic credit. Cadre (instructors and staff) are not assigned to cross-enrolled schools. All SROTC activities and functions at an institution are grouped under and organized into the Department of Military Science. In institutional matters, the designated administrative official has the same control over the Department of Military Science as with other departments in the school. At the discretion of the school authorities, the Department of Military Science may be grouped with the Department of Aerospace Studies and/or Department of Naval Science, if present, into a single large academic division. The Army SROTC program is a cooperative effort, contractually agreed to between the Army and host institution, to provide junior officer leadership training in the interest of national security. The Army cooperates with host schools to produce well-educated young men and women with leadership potential for civilian enterprise and national defense. The Army is willing to receive valid criticism, regardless of source, to maintain a working program. The right of orderly campus dissent is recognized. However, the Army has limited tolerance for anti-ROTC activities that degrade and distort the Army. When a host institution does not support the ROTC Program, the Army will consider disestablishing the ROTC program at that institution. Army SROTC is currently offered more than 800 colleges and universities. The Army ROTC Scholarship Program provides financial assistance to those students who have demonstrated academic excellence and leadership potential. The U.S. Army Scholarship Program's purpose is to provide for the education and training of highly qualified and motivated young men and women who have a strong commitment to military service as commissioned officers. The number of cadets in the scholarship program at any one time is limited by law (10 USC 2107). There are two, three, and four-year scholarships available. Scholarships are awarded at different monetary levels. At some schools, an ROTC scholarship is worth up to $80,000, which goes towards tuition and educational fees. Also, scholarship winners receive an allowance of up to $1,500 a year. ROTC scholarships are not based on financial need. Instead, they're awarded on merit. Merit is exhibited in academic achievement and extracurricular activities, such as sports, student government or part-time work. If you are 17 years of age when you enroll, your parents or guardian must also sign this contract. If you are 18 or older, only your signature is required. This contract contains a requirement to repay the United States Government for all financial aid received if after you begin your sophomore year, you fail to comply with the term of the contract. This repayment may be monetary or in the form of enlisted service. The choice rests with the Army and not the scholarship cadet. Even without a scholarship, students can sign an enlistment contract, enroll in ROTC, and (ultimately) obtain a commission. Nonscholarship students incur a service obligation to attend the advanced course, but not the basic course. They are not authorized to access classified instructional material. They are in good standing and attending school full time. There is no loss in effectiveness of military instruction. Such participation is not otherwise prohibited by law, DOD Directive or Army Regulation. Participate in drill, marching, leadership laboratories, field training exercises, voluntary programs, or attend basic or advanced camp. Be issued or wear the uniform. Receive credit toward commissioning or enlisted grade status through an audit of ROTC courses, or issued a DA Form 134 for having audited the course. Conditional students are those who complete part I of DA Form 597 (Army Senior Reserve Officers' Training Corps Nonscholarship Cadet Contract) but do not complete the enlistment contract. Conditional students in this paragraph refer only to those described in (1) and (2) below. It does not include alien students, or students trying to decide whether they desire to join ROTC and later strive for a commission. Credit toward commissioning cannot be awarded to students who are not officially enrolled as cadets. Applicants for enrollment in the ROTC Program whose eligibility based on medical, academic, or other criteria has not been finally determined or for whom a waiver request is pending. Students enrolled before being placed in this category will not be disenrolled solely on the basis of a pending request for waiver. Students who are ineligible or become ineligible for enrollment but whose participation in all aspects of the year of instruction involved has been approved by the PMS or higher authority. Conditional status must be resolved within a 12-month period from its inception. Conditional students will not be furnished Government-issued uniforms. Uniforms for conditional students may be purchased by the school or the student. Conditional students may wear the Army green or utility uniform while pursuing a course for which regularly enrolled cadets are permitted to wear the uniform. Conditional students are not authorized to attend the basic camp or advanced camp until their conditional status is resolved. If directed by USAROTCCC, an individual may attend advanced camp for further evaluation of an unresolved medical condition by camp Medical Waiver Review Board (MWRB). Possess proper papers establishing his or her status as an immigrant, refugee, or nonimmigrant alien. Be enrolled in and attending full-time a regular course of instruction at a school where SROTC is available. Be recommended by the proper school authority. Be recommended by the PMS. Meet the regular medical fitness requirements for enrollment in ROTC. Expenses incurred by an applicant because of these requirements are not reimbursable by the Government. Immigrant alien students are briefed, in advance that participation in the advanced course will not result in appointment as an officer. Should the student attain citizenship before graduating and be qualified in all other areas, he or she must elect to enroll in the advanced course or be released from the program. Alien students may be disenrolled from the basic course or dismissed from participation in the advanced course for any reason. Students must be enrolled in and attending full-time at a regular course of instruction at a school participating in the SROTC Program. 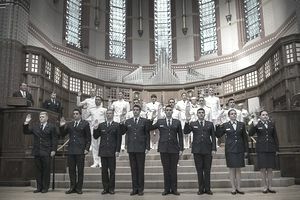 At military colleges and civilian schools, the course of instruction must lead to a baccalaureate or advanced degree in a recognized field that is compatible with the student's participation in the ROTC Program. Nursing and other medical specialty students must be enrolled in a program accredited by an agency recognized by the U.S. Secretary of Education. There are no restrictions on the student's major (except for scholarship cadets). Request for exceptions to the enrolled in and attending full-time requirements may be submitted by graduate students only, and are approved on a case-by-case basis. Minimum: Applicants must be at least 17 years old to enroll in the advanced course. Applicants under 18 years old and those who are minors for the purpose of executing contracts under the laws of the State which has jurisdiction where the school is located (even if older than 18) require parental consent for enrolling in the advanced course. Maximum: Applicants must be young enough that they will not be 30 years old or older at the projected time of commissioning. Waiver: The Commanding General of ROTC is the waiver authority for those who will be over the age of 32 at the projected time of commissioning. Applicants must have demonstrated exceptional ability and be recommended by the region commander. Region commanders are authorized to approve waivers for applicants who will be between 30 and 32 years old at the projected time of commissioning. Applicants must be of good moral character, as normally substantiated by no record of disciplinary problems or civil convictions. Applicants who have been convicted of an offense, that would normally evidence a lack of good moral character when the conviction has not been waived are not eligible for enrollment. Students must be citizens of the United States (except as provided above). The applicant must have no more than three dependents. Region commander may grant a waiver for a married applicant requesting a waiver. An unmarried applicant who has one or more dependents under 18 years old is disqualified, except as provided in (3) below. No waiver is authorized. A divorced or sole parent applicant may be processed for enrollment without waiver when the child or children of such applicant have been placed in the custody of the other parent, or an adult relative or legal guardian by court order if the applicant is not required to provide child support. If the applicant is required to provide child support, a dependency waiver is required. The region commander has the authority to grant the waiver. In both cases, the applicant must sign a statement of understanding that he or she will be disenrolled if custody of the child or children is regained while the applicant is enrolled in ROTC. An exception to unenrollment may be granted only in extraordinary circumstances such as the death of the legal guardian, or adult having custody of the child or children. An applicant with a spouse in a military component of any armed service (excluding members of the Individual Ready Reserve( IRR)) who has one or more dependents under 18 years old is disqualified. No waiver is authorized. Husband and wife teams who have one or more dependents under 18 years old are disqualified from enrollment in ROTC as a team. No waiver is authorized. Either the husband or wife may enroll without a waiver subject to other provisions of this paragraph. Change in status: Once an applicant has enrolled in the ROTC Program, a change in the status or number of his or her dependents does not constitute cause for unenrollment, and does not require a waiver. However, if the number, status, or circumstances of a cadet's dependents adversely affects the cadet's performance of duty to the extent that the cadet fails to fulfill the terms of the ROTC contract he or she may be processed for unenrollment. Pregnant students: Cadets who become pregnant during the course will not be involuntarily disenrolled solely because of pregnancy. SROTC students must be medically qualified for entry into the United States Armed Forces. All applicants must be proficient in the English language. Cadets whose primary language is not English will be given the English Comprehension Level Test (ECLT). Be enrolled in and attending as a full-time student (according to the school's criteria) a recognized course of instruction producing a baccalaureate degree, advanced degree, or an advanced education program at a fully accredited 4-year degree granting institution or at a fully accredited associate degree-granting institution that has been recognized as having established formal linkage with a fully accredited 4-year degree granting institution. Have satisfactorily completed the ROTC basic course, or received credit on the basis of other previous military training or service, or satisfactorily completed basic camp. MJC freshman - 2.0 cumulative high school GPA and a scholastic aptitude test score of 850 or an American college test score of 17. Prior service - score of 110 or higher on the general technical aptitude area of the Army Classification Battery. The student must possess qualifications for becoming an effective Army officer. Leadership potential will be emphasized as an important factor in selection for the advanced course. Applicants must possess officer-like qualifications as evidenced by their appearance, record, personality, scholarship, extracurricular activities, and aptitude for military training. Enlist in the Army National Guard or United States Army Reserves (USAR) for a period of 8 years. Be at least 17 years old by 1 October of the year of enrollment as a scholarship cadet if enrolled in the fall. Other than fall enrollees must be at least 17 years old by the time of enrollment as a scholarship cadet. No waivers are authorized. Be under 27 years old by 30 June of the calendar year in which eligible for appointment. An extension may be granted to prior service applicants if the applicant will be under 30 years old by 30 June of the calendar year that he or she is eligible for appointment. The length of extension may not exceed the actual period of active duty service. Be of good moral character as evidenced by home, community, and school activities. Exhibit a strong desire to obtain a commission and pursue a military career in the Army. Possess potential to become an effective Army officer. Leadership potential will be emphasized as a very important factor for selection and continuation of a scholarship. Applicants must possess officer potential as evidenced by - (a) Appearance. (b) Personality. (c) Academic excellence. (d) Extracurricular activities. (e) Physical fitness. Be medically qualified, under the standards of Army Regulation 40-501. Sign an agreement meeting the requirements of Title 10 USC 2107, and 2005. Be eligible for a Secret Security Clearance. Although a Secret clearance is not a prerequisite to awarding a scholarship, students must obtain a Secret clearance within 180 days of the award in order to retain the scholarship status. Extensions not to exceed an additional 90 days may be granted by the region commander. Extensions in excess of 90 days must be approved by the Commanding General of ROTC. Scholarship cadets who receive a Letter of Intent to Deny Security Clearance from the Commander, U.S. Army Central Personnel Security Clearance Facility will be processed for termination of scholarship. Be enrolled in an approved degree program. Results of Scholastic Aptitude Test (SAT) or the American College Test (ACT). You must achieve a minimum SAT score of 920 (composite of Verbal and Math) or an American College Test (ACT) composite score of 19 to qualify for competition. If you take both the SAT and ACT, you must submit the results of both tests - your best score will be used. High school academic standing - your class size and rank are required. You must have a high school GPA of 2.5 or higher. Three school officials' evaluations. These evaluations are to be completed by teachers, coaches, or the principal. If you are attending the United States Military Academy (USMA) Preparatory School, you must have one of these evaluations completed by a USMA Preparatory School Official. Extracurricular participation, athletic activities, and leadership positions held. If you have held part-time jobs during the school year and do not have the time for extensive participation in sports and extracurricular activities, you will be given credit based on the number of hours you worked per week. Personal interview. It is very important that you apply to the schools you list on your application. Your information will only be given to the Professor of Military Science (PMS) at the schools you have listed if you become an interviewee. The PMS will then contact you for an interview. In the 1999 school year, the average SAT was 1242 and 28 ACT for scholarship recipients. Conscientious Objectors as defined in Army Regulation 600-43. Homosexuals, as defined and explained in AR 635-100, paragraph 5-50 and AR 635-200, paragraph 15-2. A student who has a pretrial diversion for a felony, any civil conviction, an adverse adjudication, or any type of court-martial conviction even though the record may have been sealed or expunged unless a waiver is granted. These students may be permitted to participate in the basic course without a waiver but must have obtained a waiver prior to attending basic camp or enrolling in the advanced course. No waiver is required for minor traffic offenses resulting in a fine of$250 or less, except when the applicant has accumulated six or more such offenses during any 12 month period. Waivers are not required for disciplinary actions in connection with the provisions of the Uniform Code of Military Justice (UCMJ), Article 15. Such disciplinary actions will be considered when evaluating the applicant's character, however. In requesting a waiver, the student must list all the above proceedings, whether by military or civilian courts. A student who is a commissioned officer, a former officer or who has a certificate of eligibility for appointment as a commissioned officer. A student who will have 10 years or more of active Federal service at the time of commissioning. A student who has demonstrated a pattern of misconduct consisting of discreditable involvement with civil or military authorities or who has committed a serious military or civilian offense, whether it resulted in trial or conviction or not if a punitive discharge would be authorized for the same or a closely related offense under the Manual for Courts-Martial. Waivers may be granted by Commanding General of ROTC. Any applicant for entrance into the SROTC Program (to include former cadets, prior servicemembers, and current servicemembers) who has previously tested positive for tetrahydrocannabinol or cocaine use by a DOD certified drug testing laboratory using procedures established by the Assistant Secretary of Defense for Health Affairs, is permanently ineligible for the SROTC commissioning program. Those who have tested positive for alcohol under DOD criteria to include prior service and current servicemembers who have undergone or undergoing rehabilitation are also permanently ineligible for the SROTC commissioning program. The Army SROTC program is divided into four phases: the Basic Course, the Basic Camp, the Advanced Course, and the Advanced Camp. The Basic Course generally covers the freshman and sophomore years. If a student completes the basic course, they do not have to attend the "Basic Camp." The basic camp is designed for students who do not complete the basic course, in order to allow them to "catch up," to enter the Advanced Course. The Advanced Course is a requirement to obtain a commission. The Advanced Camp is a requirement for graduation from the Advanced course. ROTC Basic Camp is required for all applicants who have not completed or received credit for completing MS I and MS II. It is designed to bring students to a level of military training that will qualify them for enrollment in the advanced course. Nursing majors can elect not to attend basic camp. A training program is provided on-campus to meet the MQS-I required for these nurse majors. Training at Basic Camp is rugged and intensive. Special emphasis is placed on physical conditioning and practical hands-on work. There is very little classroom work. To the maximum extent, all training is conducted outdoors and consists of exercises that permit the student to be an active participant. Classroom-type instruction is held to a minimum. Practical training in leadership is stressed throughout the camp period. To develop initiative and leadership and to ensure practical experience, students are rotated in positions of responsibility of command. Qualified applicants who successfully complete ROTC Basic Camp or the 4-semester Nurse Training Program are given credit for the ROTC Basic Course. The advanced camp mission is to train cadets to leadership and Army standards and evaluate their officer leadership potential. Special emphasis is placed on technical and tactical skills and leadership development. The advanced camp is a mandatory part of the Advanced Course that supplements the campus training with practical experience in a field training environment. The advanced camp is conducted as part of the advanced course, normally between the third and fourth year of school. Special emphasis is placed on leadership training. Successful advanced course completion is a prerequisite for a commission in the United States Army. The Nurse Summer Training Program (NSTP) may be substituted for the standard camp for cadets with a nursing academic major. Interservice transfer of ROTC students is limited to justifiable cases. The request for transfer to an Air Force unit must include an endorsement from the Professor of Aerospace Studies of the unit to which transfer is requested, which contains a statement that tentative approval of the transfer depends on the approval of Army authorities. Scholarship students may not transfer after entering the sophomore year. In the case of a request for transfer to an Army ROTC unit, the PMS will consider the effect the transfer will have on enrollment objectives and existing Army-Air Force relations. Credit may be granted for Air Force ROTC courses completed, except that the cadet must attend the Army ROTC Advanced Camp. The Commanding General of Army ROTC may grant a waiver for attending the Army ROTC advanced camp. Transfers between Army and Navy ROTC units are not authorized. If the student has terminated his or her affiliation with the Navy, ROTC credits may be given for periods of Naval training. The PMS may unenroll a ROTC basic course cadet for enlistment in the USMCR for the Platoon Leadership Course program. The PMS may approve a request for unenrollment from nonscholarship advanced course cadets for this purpose. Request from scholarship cadets (MS II and the advanced course) are submitted through channels to the Commanding General of Army ROTC. Contrary to popular belief, graduating from the ROTC program does not automatically confer an appointment as a commissioned officer. The service must offer the appointment. Cadets are commissioned in either the Regular Army or Army Reserves (or National Guard, if enrolled in ROTC under a specific National Guard program). Age. Have reached their 18th but not their 30th birthday by the date the appointment is accepted. The maximum age limit may be waived, in some cases. A waiver granted for enrollment or continuance in the ROTC Program is also a waiver for an appointment. Character. Be of good moral character and possess officer-like qualifications as evidenced by appearance, personality, scholarship, and extracurricular activities. A waiver granted for enrollment or continuance in the ROTC Program is also a waiver for appointment provided such waiver does not create a violation of applicable statutes or AR 601-100. Citizenship. Be a citizen of the United States. Education. Have achieved a cumulative GPA of 2.0 on a 4.0 scale or its equivalent and possess a baccalaureate degree conferred by an accredited 4-year degree granting institution. English language aptitude. Each cadet who does not speak English as his or her primary language must be able to achieve at least 90 on the ECLT and DLI skill rating of 2+ in comprehension and 2 in speaking. Waivers are not authorized. Medical fitness. Meet the medical fitness standards that apply at the time of enrollment in the advanced course. All ROTC cadets must meet the height and weight standards established in standards established in AR 600-9, at the time of commissioning. Military training. Have successfully completed the course of military training as prescribed by law and SROTC regulations and the required advanced camp training. Physical fitness. At the time of commissioning, meet minimum Army physical fitness standards. Recommendation. Be recommended for appointment by the PMS. Personnel security eligibility. Prior to appointment, cadets must possess a secret personnel security clearance based on a National Agency Check. The Green to Gold program seeks talented young enlisted soldiers who have decided to leave or are considering leaving, active duty to attend college. Quality enlisted soldiers with officer potential who have served at least two years on active duty are allowed to voluntarily request discharge from active duty and enroll in Army ROTC to earn baccalaureate degrees and commissions as second lieutenants.